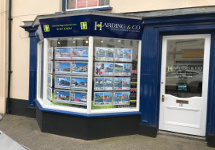 Our busy office is centrally situated in Bideford’s main commercial street with on street parking normally available outside. The office is open Monday to Friday 9.00am to 5.30pm and Saturday 9.00am to 2.00pm. We are closed bank holidays and Sundays, although viewings can usually be arranged outside opening hours by contacting 07594 363683.